As we all knows that there are number of popular browser already in the market like Google Chrome, Safari, Internet Explorer, Firefox or Opera. And now there is one more browser breaking into the market named RockMelt. 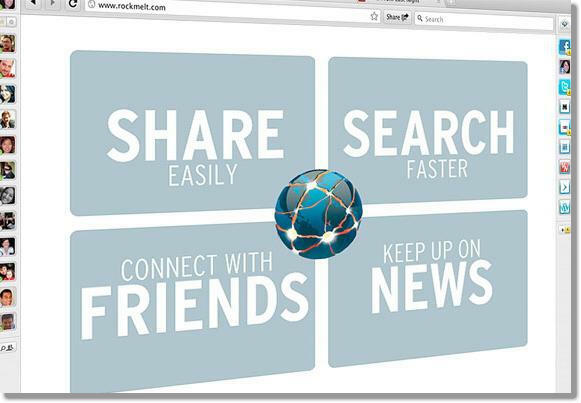 RockMelt supported by Netscape founder Marc Andreessen and it’s the browser which completely runs on the cloud which means no need to login to your different social networks on a new machine, just log in to your browser using Facebook and you are good to go. RockMelt integrates social networks like Facebook and Twitter in its interface eliminating the need to multiply the independent tools or plugins and other extensions such as the excellent Yoono. On the right of the browser, where your Twitter and various other bookmarks are placed. RockMelt soon propose other social media like YouTube, Flickr, etc. To get an invitation you should go to the official website and visit their official Facebook page where they will placed you on a waiting list. The team will then send you a download link a few days later.